The magnetic field of the Earth varies in direction and strength from the poles to the equator in predictable manner. In fact the field is similar to the field of a bar magnet located at the center of the Earth. The field is strongest at the poles where the magnetic field lines of force point directly into (north pole) or out of (south pole) the ground. At the equator, Earth’s magnetic field is weakest and the field lines are parallel to Earth's surface. Magnetic field strength is measured in units of Tesla. The average strength of Earth's magnetic field is about 50,000 nano-Tesla, where nano is 10^-9 or one billionth. Below are maps of the strength (intensity) and direction (inclination) of Earth's magnetic field. 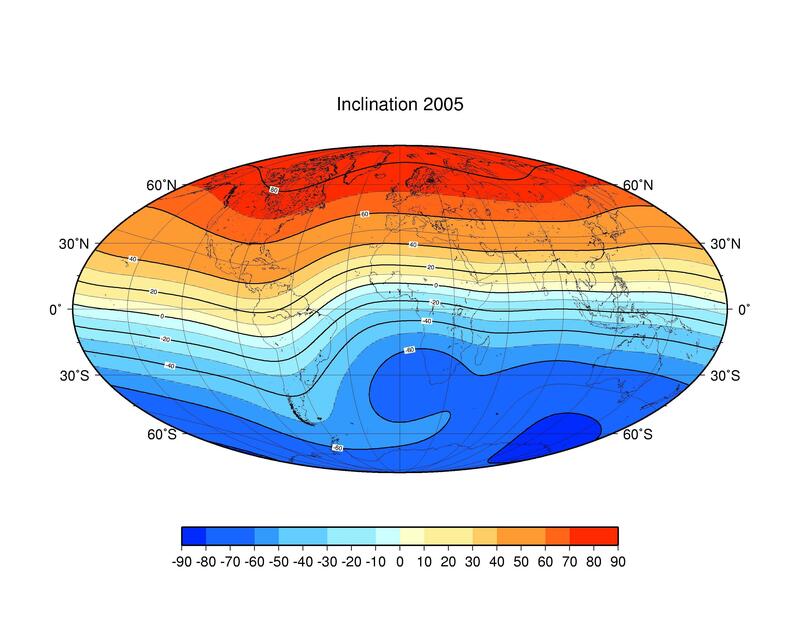 These magnetic field maps were computed from a mathematical model of the geomagnetic field based on satellite and ground observations. This model uses a spherical harmonic expansion to describe the field. 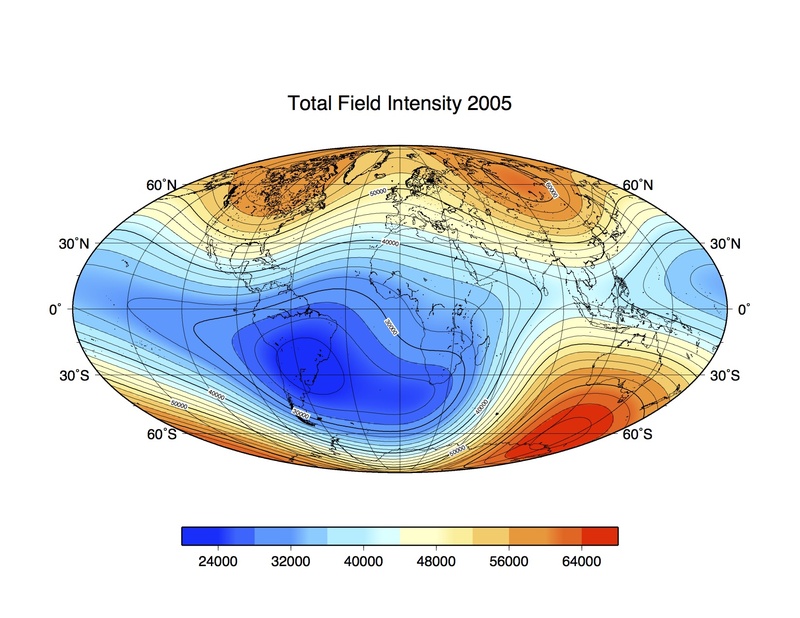 The model field is updated every five years in what is called the International Geomagnetic Reference Field or IGRF . The current IGRF is for 2015 but past models are archived back to 1900. The geomagnetic field changes over time : click here : to see a movie of this change over the past 100 years. We measure the magnetic field using a sensor called a magnetometer that directly measures the strength of the magnetic field (follow this link to sensors used in my research). The sensor is usually towed at the sea surface some distance behind the ship (to get away from the metal of the ship), or the sensor may be towed from a deeptow cable so that the sensor is close to the seafloor. Magnetometers can also be attached to a deep diving submersible like ALVIN, or to a remotely-operated vehicle (ROV) like JASON, or to autonomous underwater vehicles like SENTRY. A magnetic anomaly is the residual value we obtain when we subtract out the predicted Earth’s main magnetic field from the measured magnetic field. We make this correction because Earth's main magnetic field is generated deep inside Earth's core, however, we are interested in the magnetic properties of the volcanic rock of the seafloor. Magnetic field also varies as function of the distance away from the magnetic material, so measurements made a long distance from the seafloor are generally weaker than those closer to the seafloor. We have to take these effects into consideration when trying to determine the magnetic effects of the seafloor lavas. The magnetism of a material (rather than the magnetic field it creates) is called its magnetization and is measured in units of Amps per meter or A/m. Young volcanic lavas on the seafloor generally have a magnetization between 10 and 100 A/m, in contrast an ordinary laboratory bar magnet has a magnetization 200 times that of a rock.